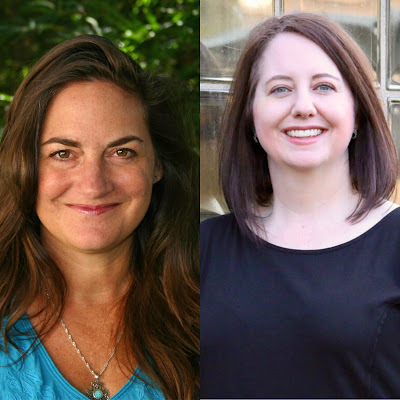 Today I'm excited to share the publishing journeys of two Texas middle grade authors, Samantha M. Clark and Melanie Sumrow. I’ve always wanted to tell stories, since I was a kid and wrote plays for my cousins then puppets to act in (the puppets were easier to direct). But although I started my first novel when I was in college, I didn’t get serious about it until I was older, mostly because I didn’t think it was something I could do seriously, as a career. Still, I’ve been writing throughout my life in many different ways, and I think it all helped me be the writer I am today. In college, I studied journalism and theater, including playwriting. As an actor, I learned how to think like another person. As a playwright, I learned how to tell big stories in small scenes. After college, I was a journalist and editor for years. As a journalist, I learned how to reveal information and lead a reader along a story. As an editor, I learned how to revise for brevity, meaning and understanding. When we moved to Los Angeles for my husband’s work, I decided to take the “When in Rome…” idea to heart and put my dream of writing a novel on hold to try writing screenplays. Through studying screenplays, I learned dialogue, plot and showing a character. It was actually while I was working on my fifth screenplay that I knew I wanted to go back to novels. I had written a long treatment for the story and realized that I enjoyed writing all the description and details, not just creating the story and dialogue—I didn’t want to just be the scripter; I wanted to be the actors, director, art director, costumer, everything for the story, so I returned to novels, where my heart had always been. All that contributed to my craft, but once I got serious about writing novels, I took it further by going to every regional Society of Children’s Book Writers & Illustrators conference in my area, watching webinars, joining critique groups, getting professional critiques, paying for mentorships, reading craft books, revising, revising, revising, and reading, reading, reading, in my genre and others. All this helped me become the writer I am today, and I’m still learning. This is a great question, and there were many for The Boy, The Boat, and The Beast (Paula Wiseman Books/Simon & Schuster, 2018). It was the third manuscript I wrote and very different in structure and style from my first two. I had an idea for what the story could be in my head, but I had no idea how to replicate that on paper, so it was scary, and many, many times I thought I would never get it right. The initial idea for the story was small – a boy wakes on a beach with no memory of who he is or how he got there. That was it. After brainstorming with my husband, I figured out a few other pieces and a vague idea of the ending, which I have to know before I can start to write. But how I got from that tiny idea at the beginning to the idea I had for the end was a complete mystery. So I spent most of my first draft thinking, “Okay, maybe the boy does this now...” I ended up with a meandering mess. When I got to the end of that first draft, though, I had a big ah-ha moment. The final scene of the book, which has actually remained pretty much the same since the first draft, showed me what was really going on in the story. Brilliant! 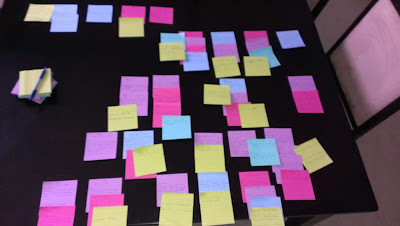 All I had to do was work that in during revisions… But once I finally understood that heart, it was even more daunting and challenging to get it right. On the surface, it’s a simple story, but figuring out when to reveal information, in what order, how to reveal it, how the fantastical elements of the world worked (all of which came about in revisions), how to get the point of view right, how to guide readers while also guiding the character and show it all without really showing it… It was a lot of work. Also, because this was so different from anything I’d tried before – and in many ways different than books I’d read – I had a lot doubt about whether I was truly telling the story the right way and whether I could ever make it really work. Ultimately, it took a lot of revisions, writing other books between revisions (and learning from them), wonderful advice from critique partners and mentors, and, most importantly, encouragement from so many people who believed in this story even when I thought it would never get published, that pushed me to keep trying. There have been many of both (ha ha ha), but I think the worst was all the times I allowed my doubts to get the better of me. Rejections were hard at the beginning, not so much because of the rejection itself, but because of what it signified to me: that I wasn’t good enough. At the time that I was getting all these rejections, I didn’t know how to get good enough, and that was frustrating. I realize now that I was querying to seek validation and help to improve, but that’s not the right reason to query agents. I wanted them to say, You’ll get this. You belong here. You’re not wasting your time. But they can’t tell me any of that, because it’s all in my hands. I now know that it’s only with hard work that I’ll get it. It’s only with perseverance that I will belong. And working and learning is never a waste of my time, even if the words I write never see more than my computer harddrive. Bethany Hegedus, Samantha and Susie Kralovansky at BookPeople launch party. My book launch party, surrounded by family, friends and even strangers, with parents telling me their kids “needed” my book, was fantastic. The Boy, The Boat, and The Beast making it to No. 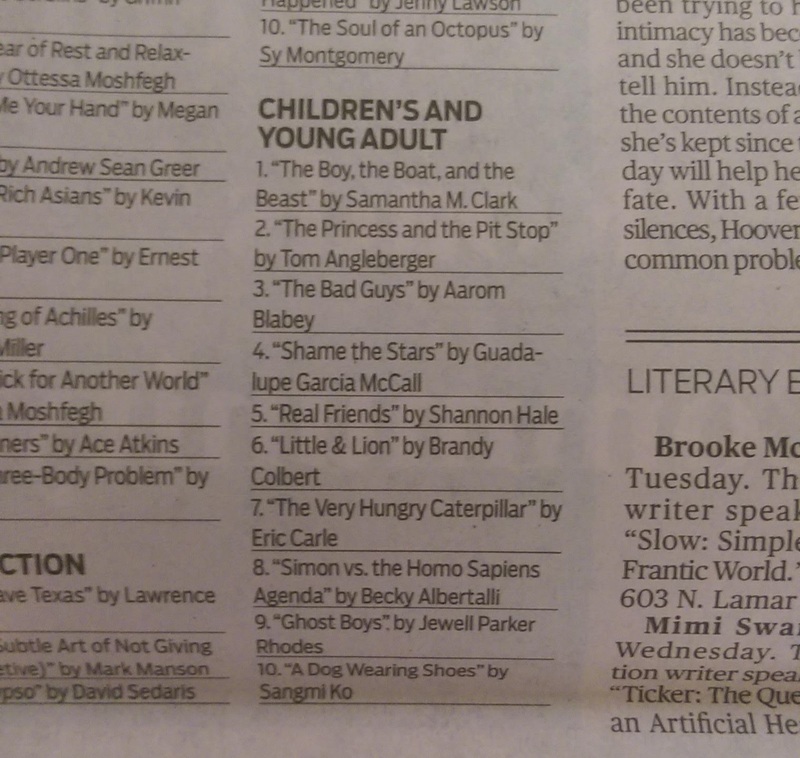 1 on the Austin American-Statesman Children’s/Young Adult Bestsellers list was incredible! And one of my most recent bests was at a signing when a boy gasped when I wrote his name in his copy of my book. I don’t know if this was his first author signing, but I know he’ll remember it. I definitely will. Ultimately, though, I have to say, all of these bests aren’t possible without the writing, and that’s the best part of all. Making friends with my characters, discovering their hearts, going with them on adventures, and sending them out to readers. That is the probably the best best. My journey to find an agent was both traditional and non-traditional. I sent out many, many, many query letters to a list of agents that I continually researched and added to. I read interviews with them, personalized letters, tried to match my manuscripts to the right agents, met agents at conferences, etc. I also submitted to every editor I could through submission opportunities at conferences. 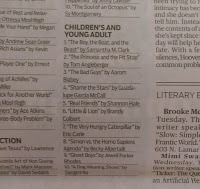 I did this for four manuscripts, three middle grade and one young adult. Some of the rejections were really nice and kept me going. When I finally signed with my agent, though, it was not because of a query letter. I was at a point where my manuscripts had been requested by around seven agents and I’d been waiting for responses for over a year – in one case, two years. I didn’t see any reason to keep sending out more queries if they were just going to be in limbo for so long. So I stopped and instead worked on a new young adult novel idea. 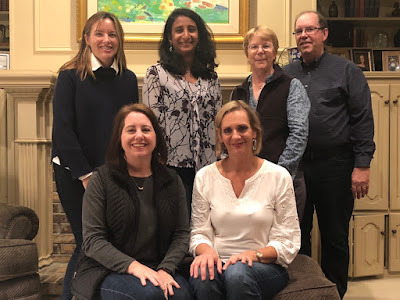 Meanwhile, I had volunteered as the Regional Advisor for the Austin SCBWI chapter (see related post), and we were putting on our first conference. My wonderful friends pitched my books to one of the agents and she asked to read them. To be honest, I had zero expectations for any connection with an agent by now, but I appreciated her kindness and enthusiasm. After the conference, I sent her the two manuscripts that were out as fulls with other agents, one middle grade and one young adult. A few months later, she sent me an email passing on them, but she said that they were good, just not right for her. Amazingly, she said she wanted to help me get an agent and recommended two agents for me to query. This was wonderful, and I thanked her … and didn’t send the query letters. I know, silly move on my part, but I couldn’t see how this time would be any different, and I was very focused on working on my young adult novel. Then one day, out of the blue, I got two emails that I’d been copied on, both with her replying to the two agents she had initially recommended, saying that yes, I’d be happy to send them the manuscripts since they were both now interested. Wow! I sent the manuscripts off, and within a month, Rachel Orr of Prospect Literary offered me representation and I accepted. One of the best parts of this is that when we signed, I had three manuscripts that Rachel was interested in, plus a sequel to one that I was almost finished drafting. She chose to go out with the middle grade first, so after a few revisions, the manuscript went on submission with editors. She formulated a list of editors she thought would be interested, but she also asked for my input. Some of the editors who were included were ones I had submitted to through SCBWI conferences who had passed on manuscripts but loved my work and were interested in seeing more. 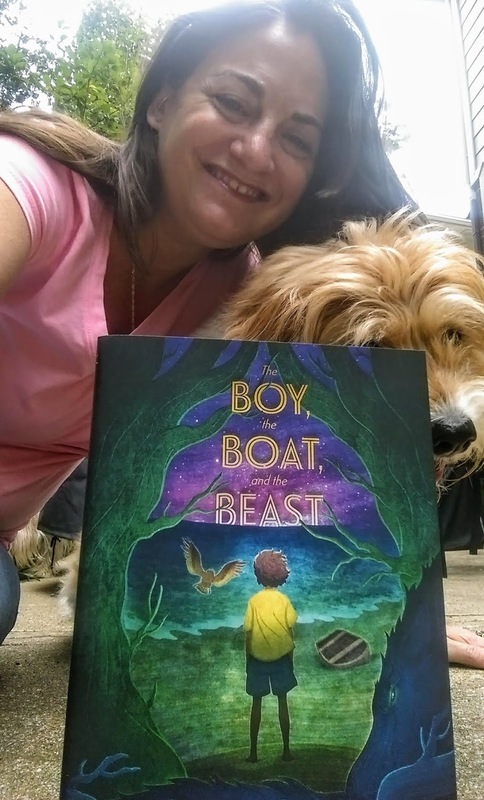 In the end, The Boy, The Boat, and The Beast got two offers – amazing – and sold to Sarah Jane Abbott of Paula Wiseman Books/Simon & Schuster. The Boy in your book faces a lot of challenges during his journey, including his own negativity. Do you have insight for other writers about focusing on the positive? Yes, doubts have always been a big obstacle for me, and this is why The Boy, The Boat, and The Beast is such a personal story. I’ve battled the idea of “being enough” since I was a kid, and I think it’s something a lot of people deal with, especially creators, because what we do is subjective. There’s no 2 + 2 = 4 way to show us that what we’re doing is right and has value. I still have negative thoughts and don’t think I’ll ever stop, but with my writing career, a turning point for me came when I stopped focusing on the part that others would do and instead focused on what I could do: I could write my best story. Period. When I started focusing on my craft, the rejections were still hard, but I had a lot more hope because I knew I was working on improving. I no longer stalked my inbox waiting for replies to queries. I couldn’t control when they’d come in or what they’d say. In fact, when I did get email replies, I assumed they’d be rejections and sometimes didn’t look at them for a day. I told myself that I was too busy for that because I was a writer and I was writing. I’d open the email when I was in a better space. Focus on writing your best story, and do everything in your power to do that. Be around others who are going through the same thing. They’ll understand your pain. The children’s book industry is incredibly supportive, especially SCBWI, and I’ve always found wonderful support and encouragement from them. Get involved and make friends. Talk to others and you’ll see that they’re going through the same things as you. Help other people. Whether it’s through a critique group or volunteering with your local SCBWI chapter, helping other people will let you see the value in you. Maybe you can’t answer a question about marketing right now, but you might be able to help someone format their manuscript properly. Everyone has something they’re good at and they can give. Giving makes us feel good. And bonus, you never know how that giving will come back to you. Try not to compare your journey with others’. This is hard to do; it’s human nature to judge our successes on the successes of others. But everyone’s journey is different. I can guarantee that at some point, someone else has thought they were lacking because they’re seeing something good in your life, and if this hasn’t been the case now, it will be. Read through the amazing interviews on this blog, and you’ll see that there are far more stories of authors facing rejection after rejection after rejection before they found any success than there are stories of quick successes. Focus on you and what you can control. This is such an amazing profession to be in, but it’s also not an easy industry. There’s a lot of rejection, most of the time not much money, and it takes a lot of work. And often, the road to that published book is long (remember those manuscripts I had sitting in agent inboxes for over a year?). It’s easy to think you’ll never make it, that you’re not good enough, and that you should give up—I thought I should many, many times, but telling stories is all I’ve ever wanted to do. So to get through all the ups and downs of publishing, you have to believe, in yourself, in your story, and in the fact—because it is a fact—that hard work and perseverance will get you to the finish line… and then you’ll do it all over again with another story. My daughter inspired me to write for the upper middle-grade audience. When she was ten-years-old, she wanted something different than what she had been reading. The kinds of social justice books she was seeking, whether historical or contemporary, were few and far between. It was easy to find what she wanted in the YA section, but as a parent, I didn’t think she was quite ready for some of the content. Lately, the publishing industry has also realized the unmet need for older middle-grade books. 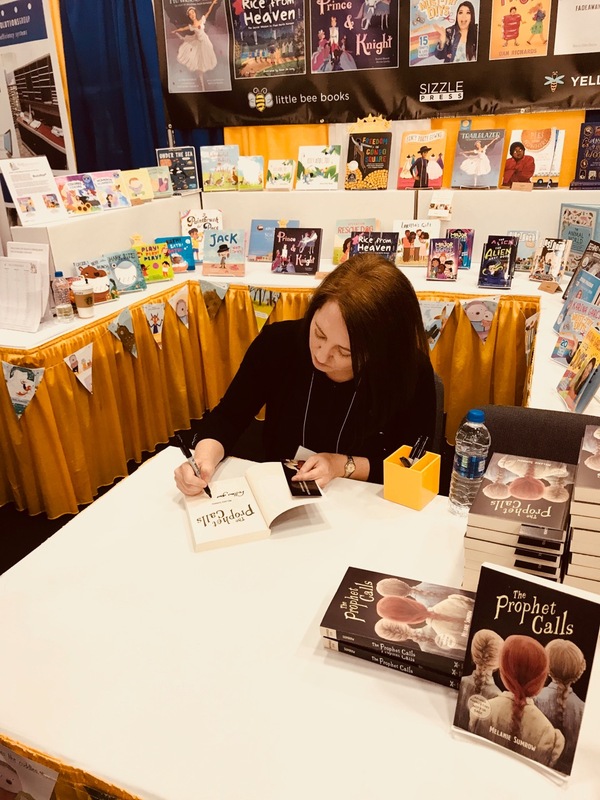 My debut novel, The Prophet Calls (Yellow Jacket/little bee books, 2018), explores female empowerment, the importance of family and questions of faith. And today, my book is not the only one targeting these older middle-grade readers. There is now a growing list of titles on the shelves that are as diverse and wonderful as their authors. I received my undergraduate degree in Religious Studies and have maintained a long-term interest in studying world religions. A couple of years ago, I was guest teaching a class on religious radicalism. For that class, I had updated my research on various religious sects, including the polygamous community known as the FLDS (Fundamentalist Church of Jesus Christ of Latter-Day Saints). Within that same time period, my agent called me and indicated an editor had contacted him (sort of as a shot in the dark), saying she was interested in polygamous communities and wondered if he happened to know anyone who could write about that subject for a middle-grade audience. Of course, my agent was very excited because he knew I possessed the knowledge, even though I’d never written middle grade. I started from scratch on an entirely new story, and my editor fell in love with The Prophet Calls. 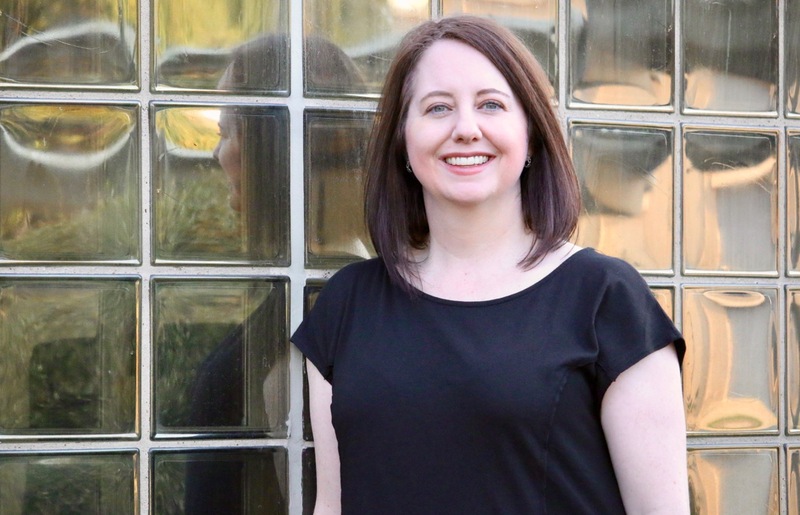 Over the last eight years, I have been very fortunate to connect with many writers both locally and nationally. First, I took a series of creative writing courses through the Writers’ Path at Southern Methodist University. I have been very fortunate to have the support of that community, which includes writers for adults and children. 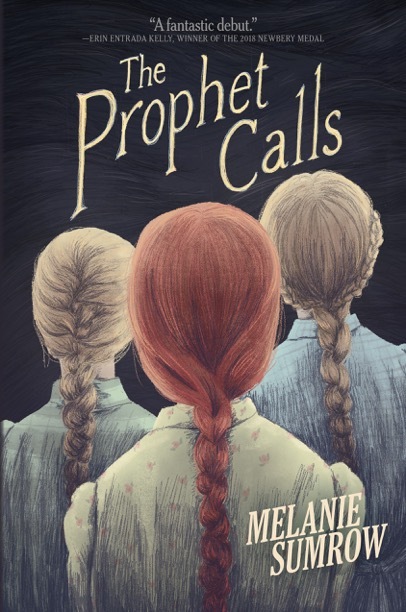 In fact, I was very excited to be in conversation with the director of the program, J. Suzanne Frank, at my launch party for The Prophet Calls. Second, I have a wonderful critique group that includes both writers for children and adults. We meet twice a month to discuss pages and the broader publishing journey. 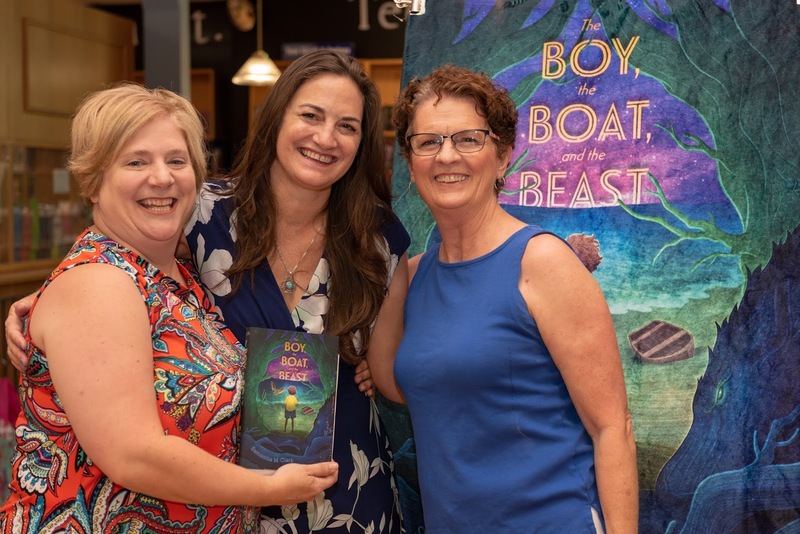 This past year, I have also had the opportunity to connect with the local published children’s writing community through periodic lunches, where we discuss the industry as a whole. Finally, technology can be a wonderful thing, and I have the privilege of being a part of the Electric Eighteens, an online debut group of YA and MG authors. This group has been particularly valuable in that we have all been going through many of the same growing pains that come from moving from unpublished writers to published authors. I know it seems trite, but my advice is to never give up. I’m serious. Keep working on your craft. Connect with other writers, because the highs of publishing are few and far between for most of us. Listen to people who know the business. Be willing to change and adapt. I shelved my first manuscript. I queried my second manuscript, and received many requests. I read every rejection and, if I saw a common thread, I would go back and revise. After over 100 cold queries and many revisions, I received three offers of representation. Although that book was well received by publishing houses, it ultimately did not sell. I was working on another YA book when the call came in from my agent to ask if I would consider writing for the upper MG audience. I did and got my first book deal with The Prophet Calls. We recently announced a second book deal for another upper MG book, The Inside Battle (Yellow Jacket/little bee, Fall 2019). In other words, I kept going. I listened. I was open to change and adapted. Today, I’m still moving forward. And there are still setbacks. I’m definitely not any more patient with the process than when I started, but persistence is definitely key. 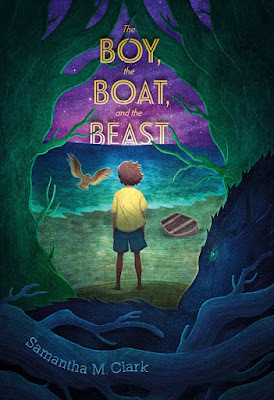 Samantha M Clark is the author of middle-grade novel The Boy, The Boat, and The Beast (Paula Wiseman Books/Simon & Schuster, 2018). She has always loved stories about ordinary people in extraordinary circumstances. After all, if four ordinary brothers and sisters can find a magical world at the back of a wardrobe, why can't she? While she looks for her real-life Narnia, she writes about other ordinary children and teens who've stumbled into a wardrobe of their own. In a past life, Samantha was a photojournalist and managing editor for newspapers and magazines. She lives with her husband and two dogs in Austin, Texas. Samantha is the Regional Advisor for the Austin chapter of the Society of Children’s Book Writers & Illustrators, and explores wardrobes every chance she gets. Melanie Sumrow received her undergraduate degree in Religious Studies and has maintained a long-term interest in studying world religions. 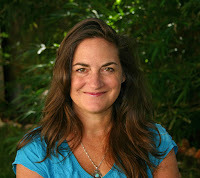 Before becoming a writer, she worked as a lawyer for more than 16 years, with many of her cases involving children and teens. Melanie lives in Dallas with her husband, her daughter and one very spoiled dog.